Any ideas what species this fish is? After heavy rain on Wednesday about a hundred of these little guys were left stranded in our field beside the drain & presumably came out of the farm pond. The coin is a 5p. Not a clue, but if they keep bringing you money I'd advise you to encourage them. It's a Teleost. Possibly an immature one. Looks like a minnow that's been dead for some time. Heavy rain on Wednesday, photographed on Thursday. They definitely weren't there on Tuesday, and a hundred is a lot to throw up... My first thought was a predator stash but couldn't think why any animals would do that, leaving them out in the open. The chickens were picking at them today, though. We're thinking stickleback because of the very slender tail and the stripes. Might have to try catching some lives ones to compare. 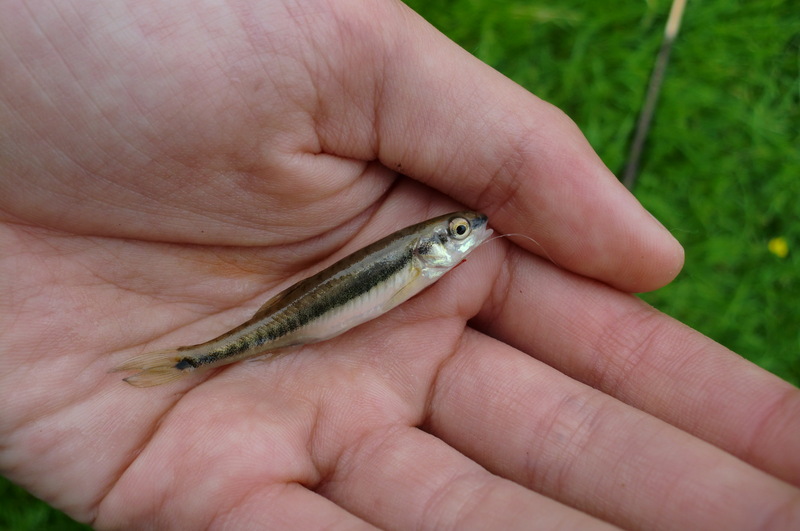 Easy way to tell stickleback is lift the dorsal fin & count the spines. 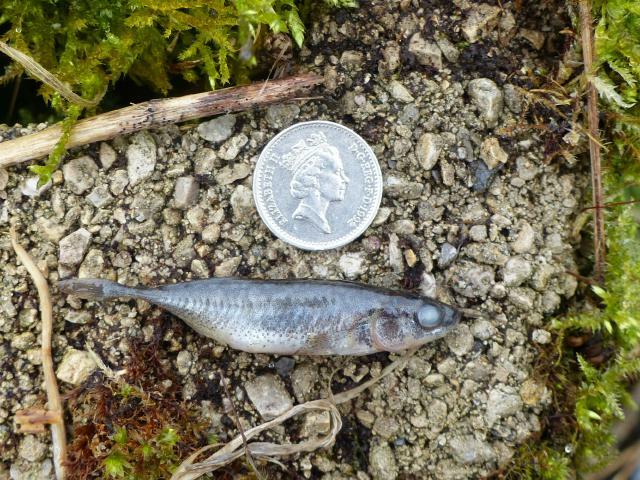 I'll bet a 50p to that 5p it's a minnow. A true minnow? I can't find a picture with such a narrow tail. I examined the bodies but they're all a bit past it now. I think it's a female stickleback. Rudd & Roach have red fins. Minnow like slow flowing, muddy bottomed fresh water. Make a minnow trap, easier than trying to hook them. Well they've certainly got slow/no flow, but the tail seems much too slender for a minnow. We shall have to see what we get. They must like the shallows to have got where they did.